Let’s take a look into some of the usually unseen parts of a great shower. In this post, we’re going to look at the shower valve and why you might replace it. Maybe you’ve heard your friend or a plumber talk about a leaking shower valve or that one was required when building a new shower. Ever wondered what the heck are they actually talking about? Pressure balancing valves and thermostatic valves are involved in controlling and maintaining the water temperature of your shower. While diverter valves and transfer valves are involved in directing or re-directing the flow of your shower water from the shower head to the tub faucet (or to the hand-held shower head, etc). The most common type of temperature control valves in the household shower. The valve maintains shower temperature by ensuring that the ratio of hot water to cold water stays constant. The valve (more info) utilizes a piston or diaphragm with ball-bearings that responds to changes in the pressure of the hot and cold water pipes. Even when pressure fluctuates, say when the toilet is flushed, the valve will restrict the flow of hot water so you don’t suddenly get scalded in the shower. Instead, the cold water is a reduced as well so overall pressure is lowered, but your shower water temperature remains the same. This valve acts to control the water temperature specifically and to a pre-set temperature. The big advantage of the valve is that you can turn the shower on and simply wait for the shower water to reach your desired and pre-set temperature. No more fiddling around with the shower taps, acting like a bank robber trying to crack a bank safe! Thermostatic valves can come in the digital electronic form or in the more common manual form. The manual form uses a heat-sensitive material, usually wax, which expands with heat and restricts the flow of hot water. In an automatic balancing act, as less hot water gets through, the temperature reduces and the wax cools and shrinks letting more hot water through. This balancing act gives you a steady temperature controlled shower. As mentioned above, diverter and transfer valves change the flow of your shower water. Diverter valves only divert water in one direction. So with a diverter, you can run water from either the shower head or the bath faucet for example. With a transfer valve, you can run water from multiple outlets. Some hand-held showers or shower panels will use a transfer valve to run water from both the fixed shower head and the hand held head or horizontal sprayers. Why change or replace your shower valve? It leaks. Obvious right? You should replace a leaking shower valve as soon as possible as it might be leaking more behind the wall where you can’t see. This could do a lot of water damage to your bathroom walls. It’s slow to react. Your shower used to be great. Now every time someone turns on another tap in the house whilst you’re showering you shriek in terror! 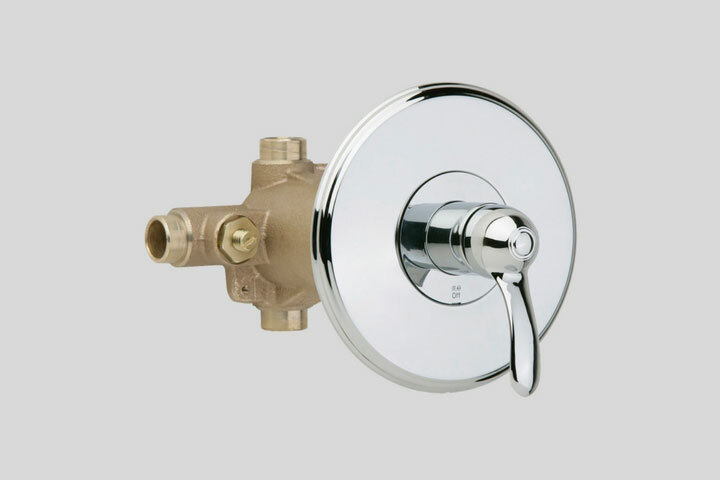 Suddenly scalding hot then the next moment chillingly cold, it’s time to change or upgrade your shower valve. You want the benefits of a pre-set automatic temperature. Having a preset and controlled temperature can save you time and hassle fiddling around with water temperature. Also, having a preset shower temperature can be a good safeguard for young children and the elderly.